Houses have traditionally sold well during the festive season, normally peaking around Diwali. Buffeted by rising cost of land and construction in an economy that was lethargic at best, the real estate sector had looked forward to the festival season to offload rising inventories. But the expectations were belied. According to experts, developers and brokers, this festive season saw the worst period after the global recession struck in 2008-09. Instead of high demand and blockbuster sales characteristic of the period, developers had to resort to freebies and discount schemes to lure customers. And yet, the season, which normally accounts for as much as 25 per cent of the total annual sales of houses, remained sluggish. 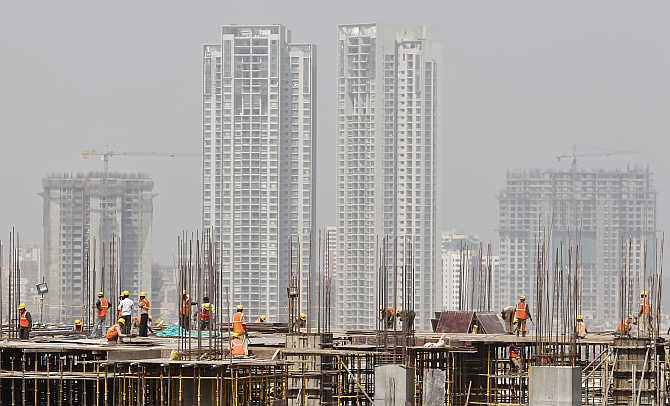 “This has been one of the worst years in the realty sector…sales are down, inventory is high and prices have peaked,” says Pankaj Kapoor, managing director, Liases Foras, a real estate research firm. “There is a wide gap between affordability and pricing, which is why sales are not happening. There is no oversupply. It is just that supply has out-priced consumers.” The feeling among developers is similar. 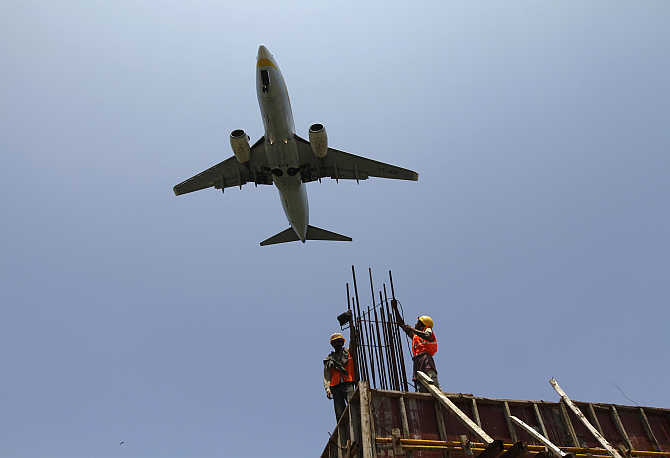 Image: Labourers work at a construction site of a commercial complex in Mumbai. 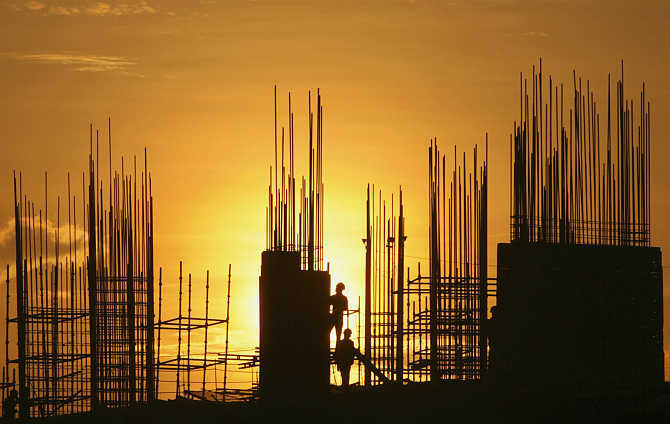 Image: Labourers work at the construction site of a commercial complex in Chennai. Yet the fact remains that the scenario in 2013 was bleak. New property launches in the residential segment across cities declined 12 per cent in the year, with Chennai recording the sharpest drop at 39 per cent, followed by the National Capital Region at 33 per cent and Pune at 20 per cent, according to a report by Cushman & Wakefield. 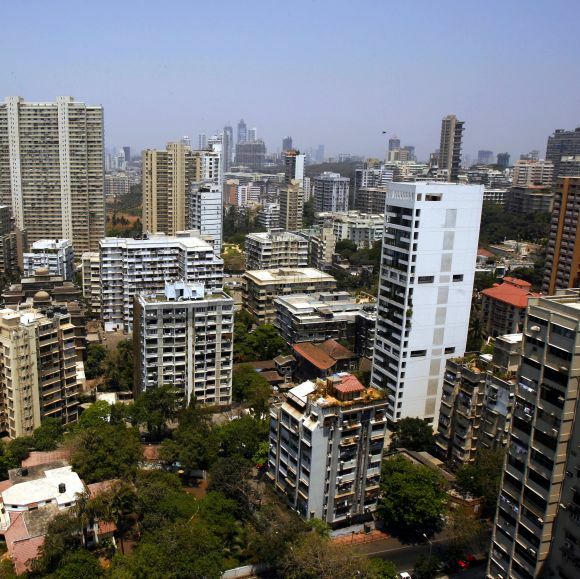 Mumbai recorded just 6 per cent growth in launches. 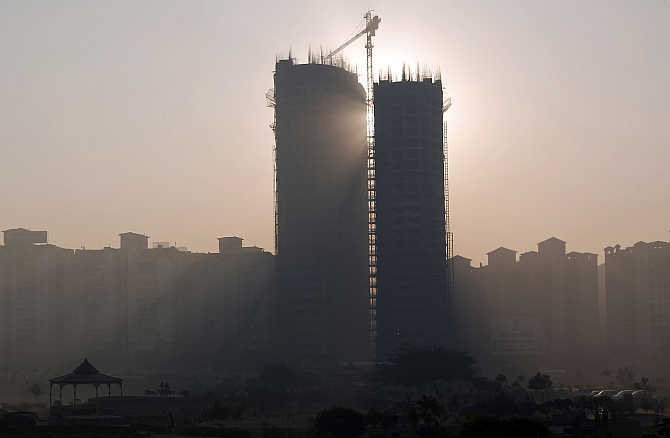 Image: Sun rays beam through two under construction residential buildings in Noida. The absorption for the January-September 2013 period declined by over 11 per cent, according to the data provided by research firm PropEquity. Out of the committed supply for this year, only 46 per cent was delivered till September. 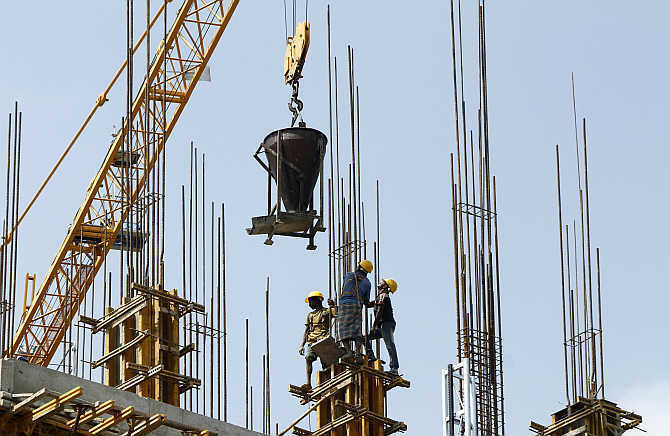 Image: Labourers work at the construction site of a commercial complex in New Delhi. The year 2013 has been a challenging one for both developers as well as buyers and investors. “The rising prices of land and higher cost of construction made the cash-strapped developers control their new launches and look forward to better sales and the increasing inflation and interest cost made the buyers wait and watch for price correction. Even investors had a hard time exiting their investments,” says Sameer Jasuja, founder and CEO, PropEquity. 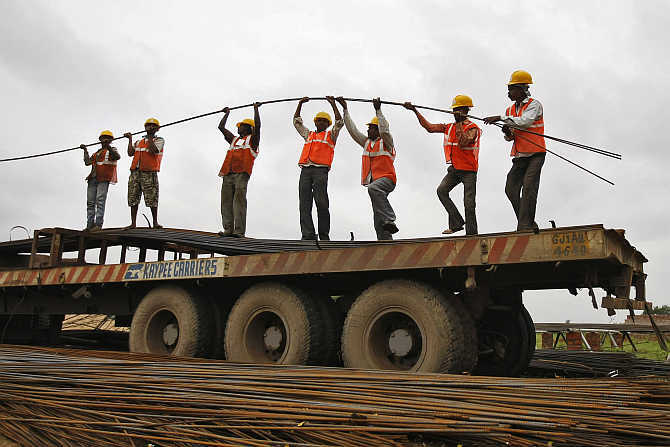 Image: Workers unload iron rods from a truck at a construction site on the outskirts of Ahmedabad. Though there are some signs of a revival in the market, it will take two to three quarters before the market stabilises. According to the latest Residex, or price index, of the National Housing Bank, prices of residential properties in around 12 cities, including Mumbai, Hyderabad and Chennai, have shown an increase during July-September over the previous quarter of this year. However, in the April-June quarter 2013, as many as 22 cities including Delhi, Mumbai, Pune, Bangalore and Chennai, saw a fall in prices after a gap of almost two years. Experts had explained this at the time as arising from developers resorting to price cuts to spur demand. 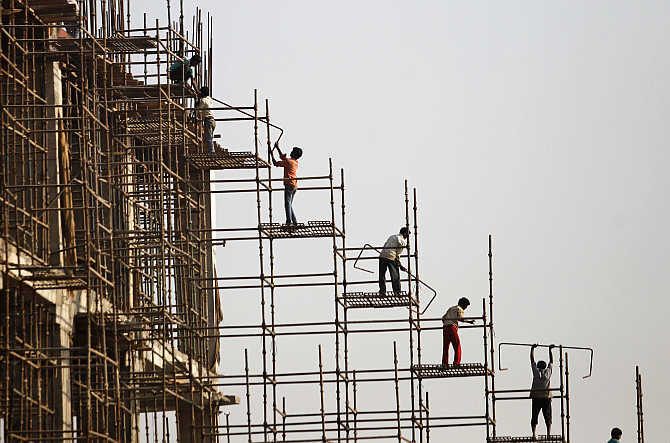 Image: Construction workers erect scaffolding in Chennai. 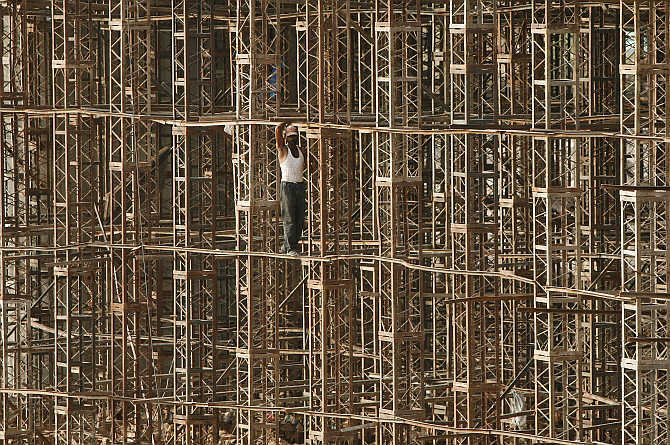 Image: A construction worker stands on scaffolding on the outskirts of Jammu. In an attempt to build their image, developers, whose credibility has been hit by delay in deliveries, have been focusing on advertisements this year. “Property and real estate witnessed 30 per cent growth in TV advertising during January–June 2013 in comparison to January-June 2012,” data by Television viewership measurement agency show. Image: Labourers are silhouetted against the setting sun as they work at the construction site of a residential building in Hyderabad. 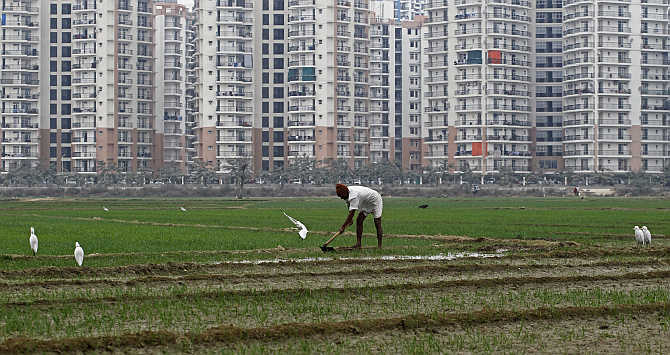 Image: A farmer works in a wheat field against the backdrop of residential apartments undergoing construction in Noida. Investing in real estate? Be cautious! Does real estate give spectacular returns?